At Lytchett Matravers St Mary’s Church. Enjoy a glass of wine, listen to our village bells, hear what needs to be done to them to restore them, model Bell demonstration. We are eager to see the 15th Century bell and its younger companions ringing for many more years for services, weddings, funerals and other events. Come and join us to hear the many different ways you could partner us in this exciting venture. A talk at Swanage Catholic Hall, Rempstone rd. Dr Phil Rudkins tells a story of spies, double agents, code breaking, deception and decoy surrounding the D-Day landings. Meet outside the Bull & Boat. At Burngate Stonecarving Centre. £80 per adult. 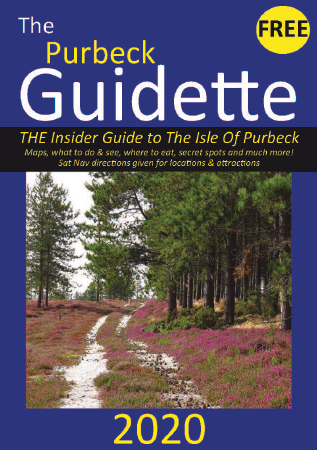 The Purbeck Guidette is a free annual publication visitor guide with local maps, what to do & see, where to eat, secret spots and much more! Sat Nav directions are also given for locations & attractions. 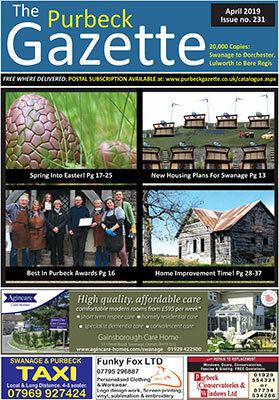 The Purbeck Gazette is a free monthly magazine covering local news, events, business, arts, entertainment, sport, health, environment and just about everything else. Every month, we print 20,000 copies (80 pages, A4) - and they all go! We also publish the entire magazine on this website in electronic format (see Latest Issue). The magazine is widely read throughout south Dorset; research suggests that although 20,000 copies are printed, readership is in fact in the order of 50,000. That's a lot of people, and includes the working resident community, the retired population, the second-home owners and a huge number of tourists, many of whom visit all year round. We believe that advertising in the Purbeck Gazette represents the very best value for money available in our distribution area. If you'd like to advertise with us, please see our online booking system (click on shop) for details of ad sizes, costs and discounts. You can then either book your space online, or call us on 01929 424239 during office hours. If you need help, have questions, or are unsure what will work best for your business, please contact us. We can offer you advice on how to make your business a success by helping you decide on an advertising budget & plan for the year ahead, and assist you with decisions regarding advert size and content. 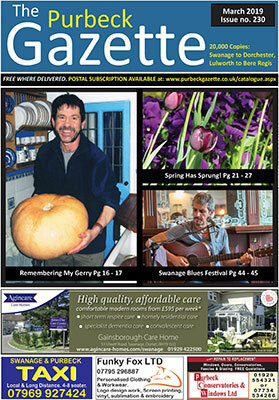 If you live outside our delivery area, you don't have to go without your Purbeck Gazette! We appreciate that even though the entire publication is available for you to read on this website, many of you would rather have a 'real' one. So, for a modest sum, one of our dedicated and delightful helpers will pop a copy in an envelope and post it to you as soon as it's available. Please order your subscription today.